IMPORTANT LEGAL ISSUES REGARDING THE WINCHESTER REPEATING ARMS WEBSITE. The "Winchester Guns" site is produced by Winchester Repeating Arms. All contents are Copyright 2016. No part of this site may be used without written permission of Winchester Repeating Arms. Winchester is a registered trademark of the Olin Corporation. Every effort has been made to ensure that all product photographs, descriptions, specifications and suggested retail prices in this on-line catalog are accurate. However, in the normal course of website production inadvertent errors may occur. Due to our continued effort to improve Winchester Repeating Arms products, changes in design or materials may result in corresponding changes to product specifications that we may not be able to immediately update on this site. Winchester Repeating Arms reserves the right to modify or change product specifications and suggested retail prices without notice. In order to better serve our customers, our standard procedure is to identify and correct any such errors as they are discovered. If you believe you have found an error, please contact us at webmaster@winchester-guns.com. Pricing listed in this on-line catalog is suggested retail for the United States only and is subject to change without notice. For actual retail pricing visit a Winchester Repeating Arms dealer near you. Winchester Repeating Arms is always pleased to receive your comments and suggestions about the products and services we provide. However, any information you provide through this website or through any Winchester Repeating Arms e-mail address, including but not limited to ideas, suggestions, notes, drawings, concepts or other information, will be considered non-confidential and the property of Winchester Repeating Arms. Winchester Repeating Arms may use any and all submissions without restriction. To report technical problems with the website, please e-mail: webmaster@winchester-guns.com. Please do not use this email address for questions about products or for customer service issues. For all product related questions use the contact information found under "Support." Product photos. Scopes and accessories. Important information about firearms shown with scopes. All photography found on this website is for illustrative purposes only. In all cases, unless specifically noted, firearms are not supplied with a scope (or any optics) included in the cost of the rifle, shotgun or pistol. When you make your purchase make sure you understand what is included with your new rifle, shotgun or pistol. Ask your dealer to confirm BEFORE you conclude your transaction. 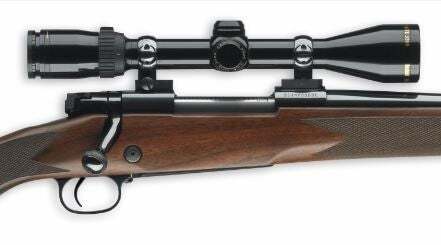 Scopes and other accessories are not included with any Winchester firearm unless specifically noted in the product description. You can expect the same great customer service you’ve become accustomed to over the years. Expert gunsmiths can help you with the most technical problems and repairs to your firearms. There are many Authorized Repair Centers (ARC) throughout the country with gun repair professionals who know your firearm inside and out. If you need service on current models, as well as older Model 70, Model 94, Model 9422 or Model 1300 firearms, please contact one of the Authorized Repair Centers or our main Service Center in Arnold, Missouri. Please call (800) 333-3288 or v.isit customer service on this website. Owner’s manuals for all Winchester® firearms in this or previous catalogs are available upon request at no charge. Owners of Winchester firearms without owner’s manuals are encouraged to view one online or request one from our Customer Service Department. Some models and calibers are only made periodically. Winchester Repeating Arms (WRA) reserves the right to delay, postpone or discontinue production of any Winchester firearm for any reason without notice. All specifications in this online catalog are subject to change without notice. Weights, stock dimensions, wood appearance, etc., may vary slightly between individual firearms. Wood is a natural product. No two pieces are alike and variation between stocks is to be expected. WRA reserves the right to modify or change specifications without notice. WRA will make every effort to make sure this catalog is accurate at the time of printing and apologizes for any errors in photographs, descriptions and specifications. Please note that the following models are or were manufactured in Japan: Models 1885, 1886, 1892, 1894, 1895, 63 and 52B. Super X2, Super X3 and 101 shotguns are manufactured in Belgium and assembled in Portugal. Model 70 rifles are manufactured in the USA or in Portugal (see barrel inscription). The following trademarks are used with permission from Olin Corporation: Winchester, the Horse and Rider design, Super X, SX2 design, Super X2, SX3 design, Super X3, Model 1892, Select, Model 101, Model 1300, Model 94, Model 70, Super X Pump, Long Beard, XPR and the red W design. Other trademarks used in this catalog: Mossy Oak Shadow Grass Blades, Mossy Oak Break-Up Infinity and Mossy Oak Break-Up Country are registered trademarks of Haas Outdoors. Pachmayr and Decelerator are registered trademarks of Lyman. Invector-Plus, Dura-Touch and Perma-Cote are trademarks of Browning. TRUGLO is a trademark of TruGlo, Inc. Marble Arms is a trademark of Marbles Arms. Weaver is a registered trademark of Vista Outdoor. © Copyright, WRA, 2016 and ongoing. No part of this website may be reproduced without the written permission of Winchester Repeating Arms. Suggested retail pricing is in U.S. dollars, are approximate and subject to change without notice. If you have any questions concerning Winchester brand firearms, visit your Winchester Repeating Arms dealer or write to: Winchester Repeating Arms, 275 Winchester Ave., Morgan, UT 84050-9333. Winchester firearms are imported by BACO, Inc.in most cases. Import information is inscribed on the firearm. Winchester is a registered trademark of Olin Corporation. A portion of the sale of every Winchester firearm is proudly donated to the Heritage Fund, which helps to expand the legal defense against politically motivated lawsuits against the hunting and shooting industry. Working together, the rightful tradition of firearms in America will continue.